It was in July 1954, just over twenty years ago, that a new vicar was inducted to the parish of Edington. Much of the present splendour of the Priory Church is the fruit of the care and labour lavished on it by Canon Ralph Dudley and his parishioners over the past twenty years. And in planning this year’s Festival I have in mind a great thanksgiving – not only for the work of the vicar and his people during recent years, but for William of Edington who founded the church, and for all those who through six centuries have maintained it and its worship, as well as for all those who take part or have taken part in the liturgy of the Festival. Countless are the numbers of people who have been touched by the irresistible spirit of Edington Priory Church: it has an atmosphere all of its own, an atmosphere that never fails to return from the very moment it comes into sight. And, whatever modem trends in Christianity may be, this Priory Church bears witness to the fact that buildings do matter. Its survival and its continuing beauty are not the result of large endowments or of aristocratic patronage, but of the commitment of a small community over the ages who have valued the strength and stability it gave to their worship. For the Festival week the present-day community is enlarged by priests, servers, singers, administrators and visitors from all parts of the country; and it is also enlarged beyond the Anglican Communion to include active members of the Free Churches and of the Roman Catholic Church. The Festival draws together people from very different traditions into its own liturgy. Amongst the singers, the boys of the Nave Choir include members of the choirs of the cathedral churches of St Albans, St Chad’s Birmingham, St Philip’s Birmingham, Ely and Salisbury, and of Winchester College; the men of both choirs include past or present members of the choirs of King’s, St John’s and Selwyn Colleges Cambridge, of Eton and Winchester Colleges, and of the cathedrals at Birmingham, Guildford and Oxford. The worship extends beyond the style and scope of any normal parish church or cathedral pattern to include music written over a period of a thousand years, drawn from the whole of the Church calendar. The life of Christ is traced in the Procession of the Christian Year, whilst the proper anthems at the Eucharists on Monday, Wednesday and Friday come from the rich repertory of plainsong for the post-resurrection feasts of Ascension, Whit and Corpus Christi. The evening Eucharist on Thursday goes back to the very institution of the Holy Communion. On Tuesday the commemoration of St Bernard, one of the founders of the Cistercian order at Clairvaux, includes music in honour of the Blessed Virgin, bringing to mind the dedication of Edington Church, and the original priory community to whom we owe this heritage. On Friday and Saturday the Evensongs and Eucharist for the feast of St Bartholomew include anthems for All Saints, exploring the broader implications of the apostle’s holy day. The remaining Evensongs reflect the various seasons with music in contrasting styles, whilst the Sequence of Readings and Music attempts to explore the unending mystery of the Divine Love. The liturgy of the Festival is only a small part of the worship. Besides those who appear in robes and vestments, there are many more who take a less spectacular part, but who contribute to the worship by their generous, largely unacknowledged help. Without their generosity the Festival would cost well over ten thousand pounds; instead it costs about a tenth of that. 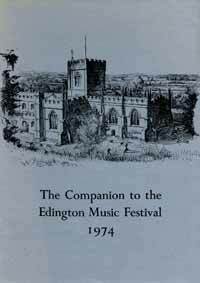 For not only do all the members of the Festival give their services freely and contribute five pounds each to the cost of their keep, but the parishioners of Edington provide free accommodation as well as every sort of help imaginable. The headmaster and managers of the village school allow it to be transformed into a canteen, supplied with equipment loaned by Dauntsey’s School, who also make leisure facilities available. Music and robes are loaned by Salisbury Cathedral and St Chad’s Cathedral, Birmingham, and there is an immeasurable debt to all the organists and parents who allow their boys to sing at Edington. Traders give special concessions, and many other individuals and organisations give aid of every kind: it is all absorbed into the expression of the Festival’s worship. It is to our congregations that we turn for help to meet the hard cash cost of the. Festival. We have been helped by a donation from the Symons-Bosley Charitable Trust, but still need at least fifty pounds in each collection to pay our way. And those who wish to make a more permanent association with the church may like to enrol as a Friend of Edington. Edington is a small place for so many people to come for a Festival. Its facilities are limited, and we would ask everyone to bear with this. A plan in the church porch shows where everything may be found. During the day when there are no services in the church there are likely to be rehearsals which you are welcome to attend. For those who want a break from the 50 or more hours of services and rehearsals that will take place in the church during the week, there will be refreshments available at posted times in the choir car park; and for those who wish to go further afield, there is a list of places of interest at the back of this Companian. I would draw your attention particulary to the special exhibition of watercolours in the jubilee Hall, Bratton, arranged by Dr and Miss Reeves. Festival the local parish and the wider parish of people who value Edington join together to fill the church with a liturgy to mirror its splendour in thanksgiving. In the music of voices and instruments, in words and movements, in silence and stillness, in listening; whatever our part, “Let every thing that hath breath praise the Lord”.